A silent cultural revolution is reshaping how we will work for generations to come—and it’s being led by Uber. In UBERLAND, Alex Rosenblat, technology ethnographer and interdisciplinary scholar at the Data & Society Research Institute in New York, shares her award-winning research on how algorithmic managers shape how drivers behave on the job. 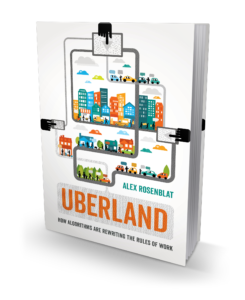 Based on Rosenblat’s first-hand experience of riding 5,000 miles with Uber drivers, daily visits to online forums from 2014-2018, and face-to-face discussions with Uber senior employees, UBERLAND illustrates how our future will be affected by the complex nature between algorithms and workers and the profound social and cultural shifts taking place today.